I remember being a kid and always wanting to order a banana split at the local ice cream shop but they were always covered in nuts so I just shied away from them. In hindsight, I probably could have asked them to leave the nuts off but when you’re a kid you’re always afraid to ask, at least I was. 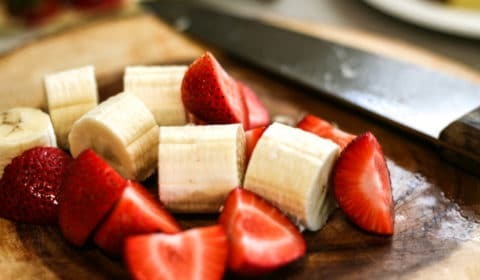 Fast-forward to today and here’s a Paleo-friendly summer treat that mimics the fruity freshness of a banana split minus the nuts and ice cream. The kids will love this! I chopped up fresh pineapple into nice squares and then sliced my banana. 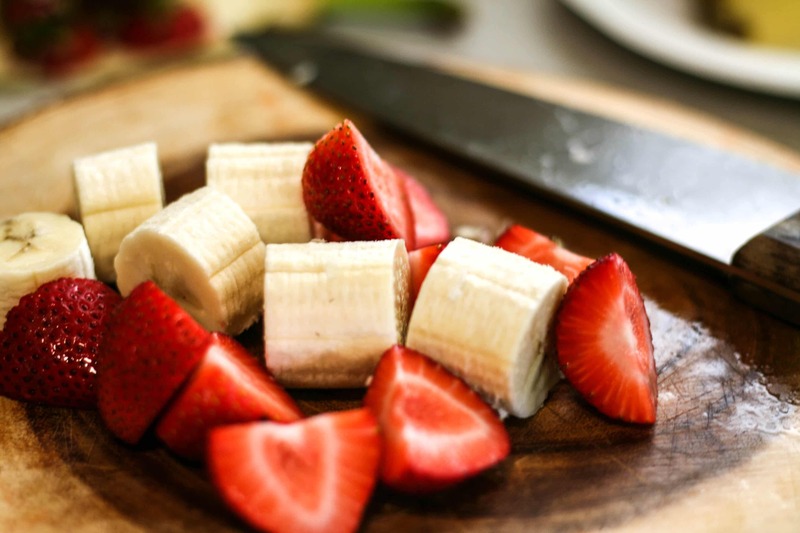 For the strawberries, you’ll want to cut those in half so you have a nice flat bottom. Then take all three pieces and slide onto a popsicle stick. I probably could have used a longer stick but these did the trick. 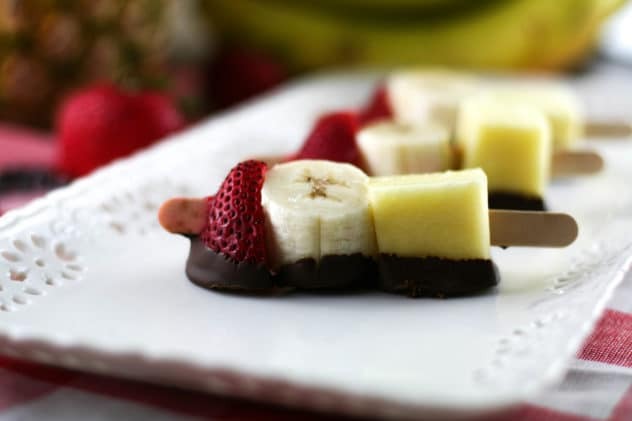 The key is to align the fruit so there is a nice even bottom to dip into the chocolate. 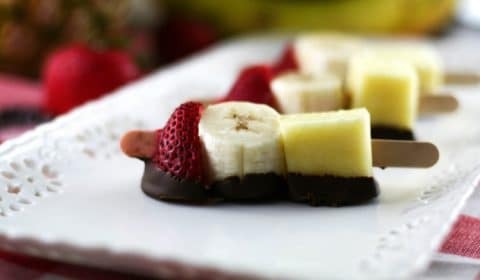 Once you have all of the fruit onto the sticks, stick them in the refrigerator while you melt the chocolate. I typically stick with dark chocolate but my kids and husband prefer the semi-sweet. I still use the dairy-free chocolate, seriously, you won’t even notice a difference. I use Enjoy Life semi-sweet chocolate mini chips. They’re non-GMO and gluten, peanut, soy, casein, wheat, egg free (along with a few more). If you’re going to indulge in some chocolate with your recipes, try these out! I melted the chocolate in a long, shallow dish so that I could easily dip the entire stick into the chocolate. 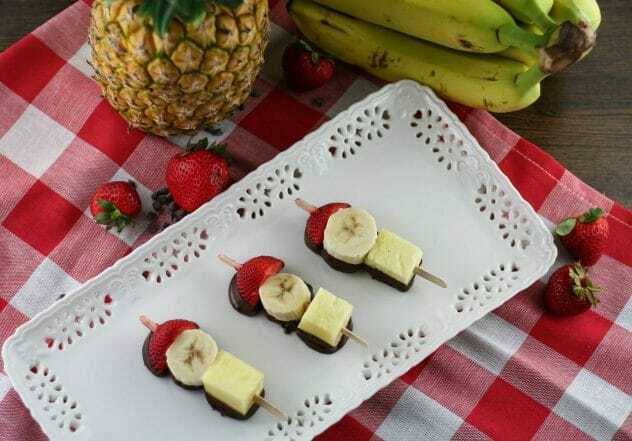 Remove the fruit from the refrigerator and dip the bottom half of the entire fruit stick into the chocolate. Lay onto parchment or wax paper, and refrigerate when done. Let the chocolate harden in the refrigerator and then enjoy!